For the three of you unfamiliar with the source material, “The Hunger Games” is set in a distant, dystopian future where a series of rebellions leads the tyrannical government to exert its control by establishing the titular ‘Hunger Games.’ Once every year, two adolescents are chosen from each of the nation’s twelve districts to compete in a televised fight to the death, where only one ‘tribute’ can survive. At the outset of the 74th Hunger Games, Katniss Everdeen, a sixteen-year-old girl from the impoverished District 12, volunteers as Tribute when her little sister, Primrose, is selected to compete. It’s a dark premise, and while I never felt the novel tapped into its potential in any substantive way, director Gary Ross displays a deep understanding of the story’s inherent horrors. The first hour, particularly the material in District 12, is imbued with a deep sense of sadness, dread, and discomfort; even before Katniss becomes tribute, it’s clear that this is a world gone horribly wrong, where her best case scenario is continuing a life of melancholy and hardship. As scary as the Games are, death may not even be Katniss’ biggest concern. Ross illustrates this all with breathtaking precision, minimizing dialogue and music to let the performances and visuals tell us all we need to know. It’s a mature, powerful, and emotionally direct way to tell the story, so effective that when Katniss offers herself as tribute – a scene that did nothing for me in the novel – I was honestly driven to tears. Ross doesn’t let up when Katniss journeys to the capitol; his depiction of the media firestorm that takes up a good chunk of the story is pointed and unglamorous, portrayed as a true psychological horror. 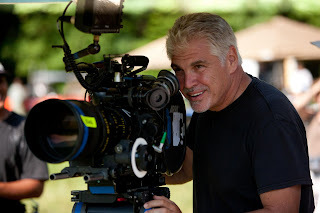 Collins flirted with social commentary in the book, but by taking advantage of film’s visual qualities, Ross dives in headfirst with unsettling implications about public scrutiny, media manipulation, abuses of power, and income inequality, all of which ring particularly true in today’s day and age. All the while, Ross slowly but surely ratchets up the tension, forcing us to feel the fear engulfing Katniss’ heart as the Games draw ever nearer. By the time she’s ready to enter the arena, the pressure is almost unbearable, as though we are standing on the precipice of apocalypse. And then the game starts, and almost immediately, everything is softened. 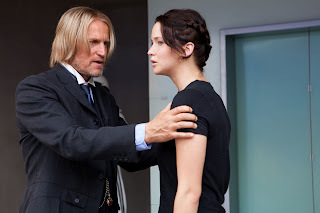 The violence – Katniss’ primary source of fear – is hidden from us, the pacing speeds up to gloss over the darkest moments, exposition is delivered in lazy, pandering ways, and we keep cutting away to the Capitol and other characters, losing our established point-of-view with Katniss. The carefully crafted tension is broken, and suddenly, the film feels a lot less mature and engaging. Ross’s stylistic genius doesn’t disappear, and he still hits certain emotional beats spectacularly, but on the whole, the film’s second half feels more like a conventional studio blockbuster than a bold artistic statement. That’s understandable, I suppose; when you’re dealing with a property as massive as “The Hunger Games,” there’s a limit to how far any studio will allow a director to drift from the mainstream, and one has to commend Lionsgate for allowing Ross as much freedom as they did. Nevertheless, had Ross been permitted to ratchet up the violence just a tad, to linger on the horror and contemplate the subtext for a little while longer, “The Hunger Games” could have been a truly significant work of art. 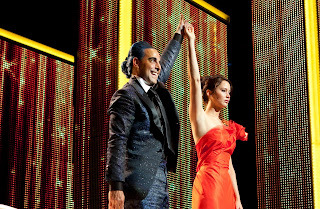 Even in the most problematic stretches, however, “The Hunger Games” is an absolutely breathtaking technical marvel. Words cannot capture my love for how Ross shot this movie; though the modern handheld style of cinematography doesn’t always work, here it is implemented perfectly. The camera swerves, shakes, and glides with tremendous artistic precision, doing just as much to tell the story as the screenplay or performances. There’s something deeply emotional, almost sensual about how the camera moves, as though the frame has a direct connection to Katniss’ soul as she experiences fear, anger, longing, and the beauty of nature. The editing is an equal part of this, giving the film a rough, instinctual rhythm that is strikingly unique. I do wish someone other than James Newton Howard had scored the film – replace him with someone capable of gorgeous nuance like Alexandre Desplat and I wouldn’t hesitate to give “Hunger Games” an A – but his compositions are nevertheless effective when they need to be. Another area where the film excels unreservedly is the acting. Ross has assembled a tremendous ensemble that adds weight to the proceedings at every turn, with brilliant work from Josh Hutcherson, Donald Sutherland, Elizabeth Banks, Stanley Tucci, Lenny Kravitz, and especially Woody Harrelson, who beautifully conveys a piercing, deep-seated pain as mentor Haymitch. But as Katniss, Jennifer Lawrence deserves special attention; the depth and breadth of her performance is nothing short of awe-inspiring. She says relatively little, but expresses so much with even the slightest glance, and seems to feel every emotion in the core of her being. 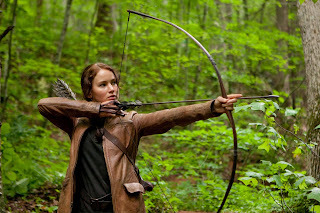 Lawrence’s Katniss is a fascinating, three-dimensional creation, and one of the best female protagonists ever featured in a Hollywood blockbuster. 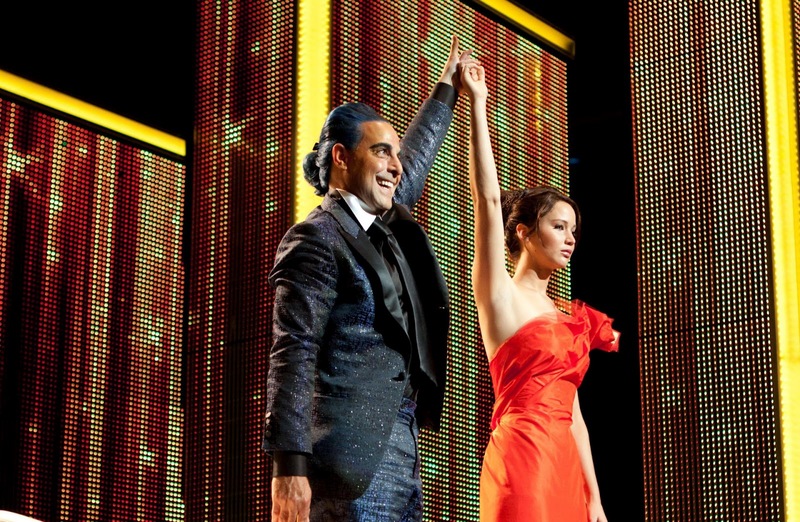 And considering the film’s studio origins and mammoth expectations, it really is remarkable how thoughtful, intelligent, and artistic “The Hunger Games” turned out to be. I personally wish the film had gone even further, but that’s more a testament to how much Gary Ross got right than those portions that troubled me. 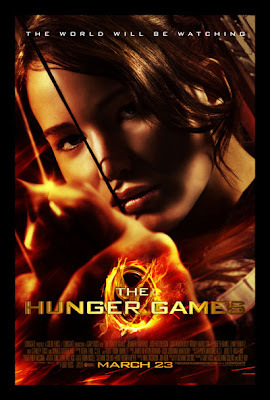 Movies this good don’t usually reach the financial heights “Hunger Games” is destined for (see “Twilight” for reference), and despite certain critical reservations, that makes me a very happy film enthusiast. This review was made possible thanks to a generous donation from Mr. Steve Oelrich. Any amount is accepted and greatly appreciated. "And then the game starts, and almost immediately, everything is softened. The violence – Katniss’ primary source of fear – is hidden from us, the pacing speeds up to gloss over the darkest moments, exposition is delivered in lazy, pandering ways, and we keep cutting away to the Capitol and other characters, losing our established point-of-view with Katniss." I agree 110%. I really just wish it had an R-rating (though I understand why they went with PG13), or really wish he pushed the boundaries with the violence. It was too pathetic, especially for a movie centralized on kids killing each other. btw, LOVED your comparisons of BR and THG. I'm a fan of both (more-so of BR), and completely missed the part on how they both ended with boy-girl winners, each romantically involved! DUH! How could I miss that? I wish I went into the film with lower expectations because it really did come off as a PG ish film (which I guess was the studio's intention). My boyfriend heavily disliked the movie as predictable and superficial (he did not read the either book, but did watch BR). I have not read the HG books yet (watched and read BR)- but I guess my comment is that HG is more 11-14 age range and entertainment focused and good addition to the Young Adult section, while I won't recommend BR for anyone younger than 18, it deserves cult/classic status.